Asda can now sell British tomatoes year-round thanks to an investment into LED lighting by tomato grower Flavourfresh. The technology is being used in the company’s 31 acres of glasshouse production, with pink LEDs installed between vines to supplement natural daylight. In addition to increasing the supply of British tomatoes, the LEDs slash the total energy required to run a glasshouse by up to 35 per cent through mitigating the need for excessive heating and ventilation. Asda would usually source tomatoes from South Africa, Spain or Turkey between December and March, but thanks to the LED technology the retailer said it can now increase its British volumes, reducing food miles and improving freshness. 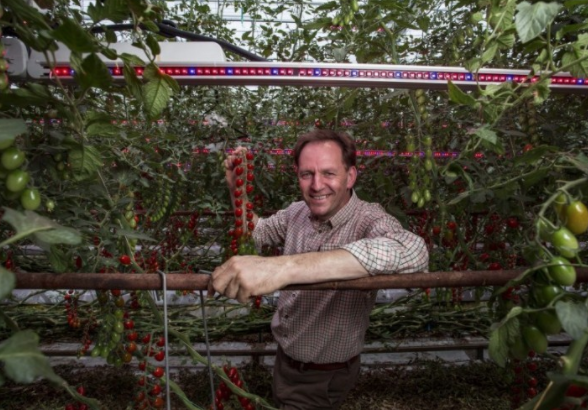 “I can say with confidence that by using this technology, I could grow a tomato absolutely anywhere – underground, in a Tube carriage, on the moon,” said Flavourfresh tomato production manager, Andy Roe. “The beauty of this technology is that it hands complete control over to the growers, who can monitor levels and adjust accordingly to ensure the best quality products possible are hitting Asda’s shelves." Asda technical director, Ian Harrison, said: “We pride ourselves on working closely with growers to make sure together, we provide the best quality produce possible for our customers.